Sterling, copper, enamel. 14-16" choker. Earth tones dominate this calming but powerful necklace. The enamel pieces are hand formed from a thin sheet of copper and colored with 3 to 5 layers of enamel each, no two are the same. 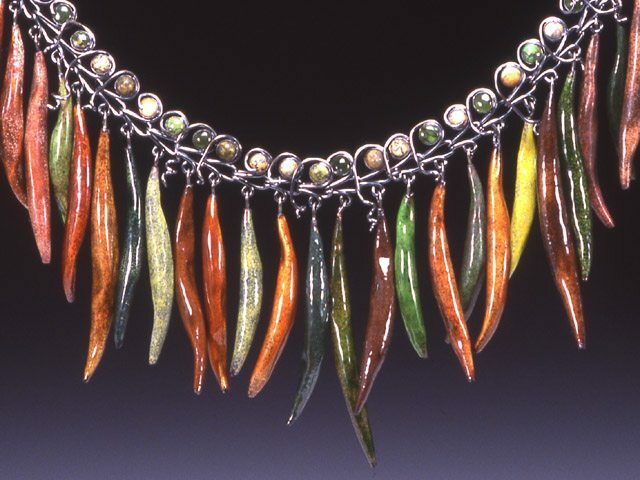 The enamel is paired with natural stones including Chinese turquoise, picture jasper, unikite, leapord jasper, and jade. This custom piece is made to order. Earrings are also available and start at $180.